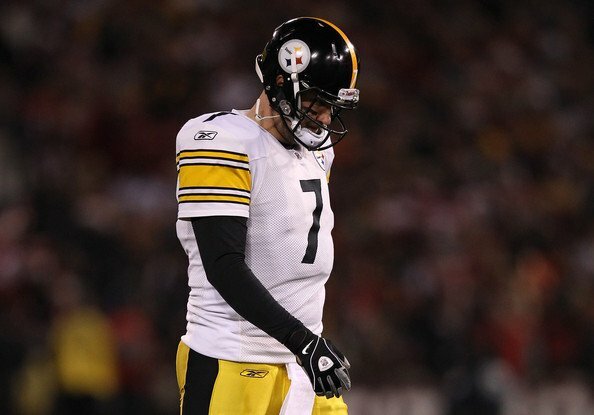 It couldn’t have been any worse for the Pittsburgh Steelers and their hurting quarterback, Ben Roethlisberger. The San Francisco 49ers were all over the in-a-rut Steeler offense, beating the co-leaders of the AFC North 20-3, on a night that was as much about blackouts and organizational failure as it was about football. It was only one team that played it. The best run defense in the league stopped the Steelers at only 84 yards. They got six tackles for loss of yards, and more importantly, they got to Roethilsberger’s head and body time and time again. 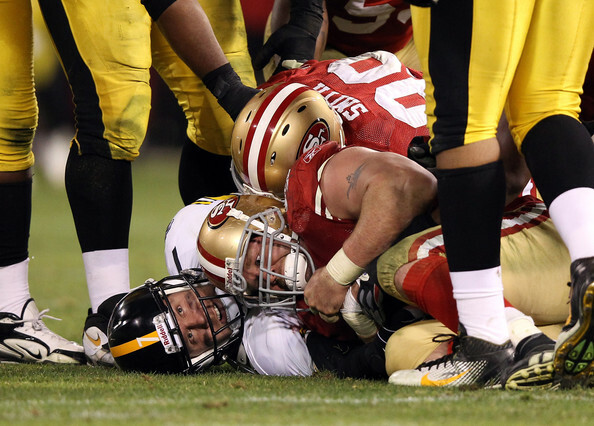 He got sacked three times, but there were 8 more recorded quarterback hits, 7 by Aldon Smith who also had 2.5 sacks. And there were the turnovers – Roethlisberger threw three interceptions and fumbled the ball twice, on the 49ers recovering it once. This was the ninth time in Roethlisberger’s career in which he threw at least three interceptions. The Steelers only won one of those. Turnovers decide the game, that’s one of the first rules of football. The 49ers? Alex Smith will never be a pro bowl quarterback, I’m willing to put my money on it. But in the right system, with the right protection, he’s good enough. The Steelers couldn’t get to him even once last night, after Smith was sacked 18 times in the last three games. Last night he threw for 187 yards and a touchdown pass to Vernon Davis. The worrying thing for the Steelers is Roethlisberger, beyond a doubt. Their offense relies on his health. Dennis Dixon or Charlie Batch won’t do. The Steelers have scored 14 points or less in three of their last four games. Their offensive problems look even worst when facing one of the best defenses in the league, a defense that hasn’t allowed a rushing touchdown all season. It bodes ill for the playoffs, which the Steelers have clinched. Roethilsberger, as expected, was just short of disgusted by his output on Monday night – I was probably the best 49er tonight. It’s very frustrating. You feel like you let down your team, your fans and your coaches. It’s tough. I’m not going to make excuses. I played a bad football game. I turned the ball over, and that one is on me. For the 49ers, it was about getting respect, about showing that this team is finally out of the NFC basement. Mike Tomlin, Steelers HC – I think we need to acknowledge that was 49er football tonight, We played the game on their terms in a manner of which they play when they play winning football. They created turnovers, they got us with a few concept plays, they controlled the ball offensively. The 49ers are now 11-3, and have two divisional away games to play. On the paper, should be rather easy. Lets not forget that their previous loss came against a divisional rival, Arizona. The two trips to St. Louis and Seattle shouldn’t be taken lightly, but still, the NFC West top spot is clinched. The big win to put themselves on the radar of everyone else has been achieved. They just need to follow up, and hope their stadium doesn’t pull off another embarrassment. For the Steelers, despite already clinching a playoff spot, it’s more complicated. Mostly because of Big Ben’s health, as he hobbles and limps after every hit, hoping he can take another Advil or whatever he prefers to keep him going. The Ravens now have the first round bye, and although the Steelers have a home game against the Rams and a visit to Cleveland, I’m betting on the Ravnes to finish first. Especially if Roethlisberger gets some rest, which he should. The playoffs are right around the corner, and with an injured Roethlisberger, playing or not, the Steelers don’t have a chance of making another Super Bowl.